1. What was the "Revolution of 1800"? The "Revolution of 1800" was in reality the ELECTION of 1800. This presidential election gained its nickname for being the first peaceful switch of power by election in modern history. 2.If you were the president, would you have approved the Louisiana Purchase? Explain. DEFINITELY! Because that is what was best for the country. But precisely why? Please explain your reason for any position taken. (Minus 1). 3.Identify a cause of the War of 1812. The British did many things which provoked America. England was at war with France at the time and both countries did their best to keep America (who was neutral) from trading with the other. This resulted in over 900 American ships being seized. Therefore, Congress passed the Embargo Act of 1807 which prohibited American ships to enter foreign ports and British ships from docking at American ports. This, on top of many other acts of Britain, (including entering D.C. and burning down the Whitehouse) drove America to declare war. Good, but note that the invasion of DC occurred after the war started. Good, but explain more. "Describe" was the question. (Minus 1). Superb. Will use as a model answer. 6. Explain what the Marshall Court is known for. McCulloch v. Maryland was one of the "landmark" decisions that the Marshall court is known for. Good, but what did that decision hold? (Minus 1). 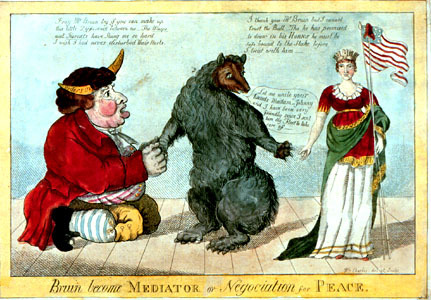 The cartoon "Bruin Become MEDIATOR or Negotiation for PEACE” was created by William Charles in the year 1813 in reference to the War of 1812. Good, but let's try to describe the point of view of the cartoonist, and what he is trying to convey. (Minus 1). Text from left to right: John Bull: Pray Mr. Bruin try if you can make up this little Difference between us-The Wasps and Hornets have Stung me so hard I wish I had never disturbed their Nests. Columbia: I thank you Mr Bruin but I cannot trust the Bull. 'Tho he has promised to draw his HORNS he must be safe bound to the Stake before I treat with him. H2. Explain the impact of the War of 1812 on the Federalist Party. When America was at war with England, the Federalists considered receding from the United States in order to show loyalty to England, but once the Treaty of Ghent was signed, they looked like traitors. Because of this, the Federalist Party became very unpopular and soon became nonexistent. H4. How did the North and South feel about tariffs, and why? The North liked tariffs because they reduced competition of imported goods. The South resented tariffs because the competition reduced the cost of producing cotton. H5.How did slavery begin to affect other constitutional rights, such as freedom of speech? Do you see an issue today causing a similar infringement of the right to free speech? In 1837, the murder of an antislavery newspaper publisher by the name of Elijah Lovejoy showed that the right to free speech and of press would be affected. Today, gay marriage seems to threaten our free speech. This page was last modified on 24 November 2008, at 10:04.